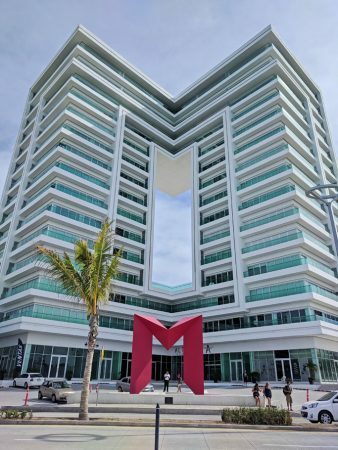 The big letters of Mazatlán. December 10 – 12, 2018. One of the last things anyone wants to hear when they are camped down the end of a dark dirt road by the beach late at night is someone outside pulling on the door handles of their van. This is what happened to us in Mazatlán. The bed was made and we were settled in watching something on the computer when we heard the disquieting sound of “clunk, clunk.” We shut off the computer and listened, then saw the glow of a flashlight through the reflectix that covers our windows. And then there was a knock on the van door. Greg slid open the side door. It was the police again. “Cómo puedo servirle?” – How can I help you, he asked respectfully this time. They told us it was “peligroso”, “no es seguro”, and “tienen que salir” – dangerous, not safe, and we had to leave. “Donde vamos?” – where do we go, I asked. “Hotel,” they replied. Of course we weren’t going to a hotel, but we had to go so we folded the bed up and pushed it back in place, pulled on our jeans, put on our shoes, and took down the reflectix. 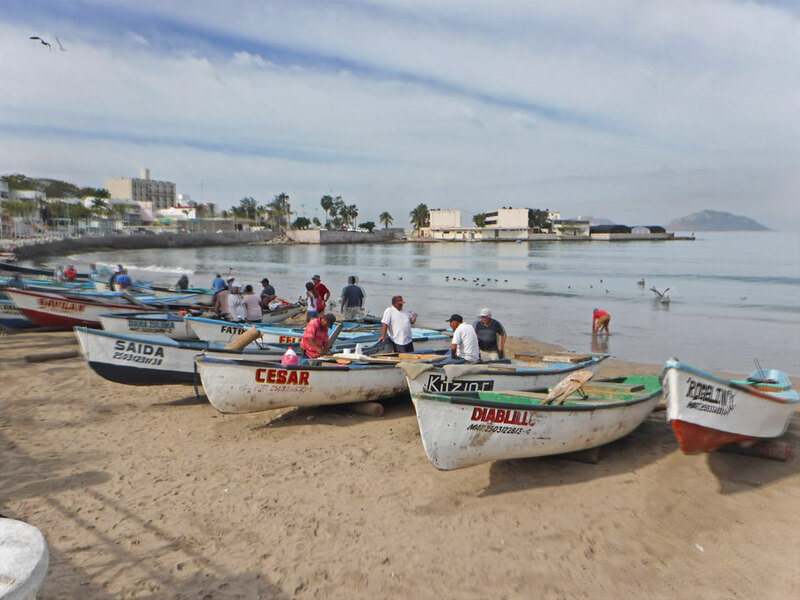 I picked up my phone, opened up my iOverlander app, and we headed out into the dark night of Mexico in a city that we knew little about to find a new spot to sleep. Unlike in the US where I use many resources – websites, apps, maps – to find established paid and free camping sites, here in Mexico I have only one – iOverlander. iOverlander is crowd sourced website/app with listings of campsites and resources for travelers around the world with reviews and GPS coordinates to locate them. 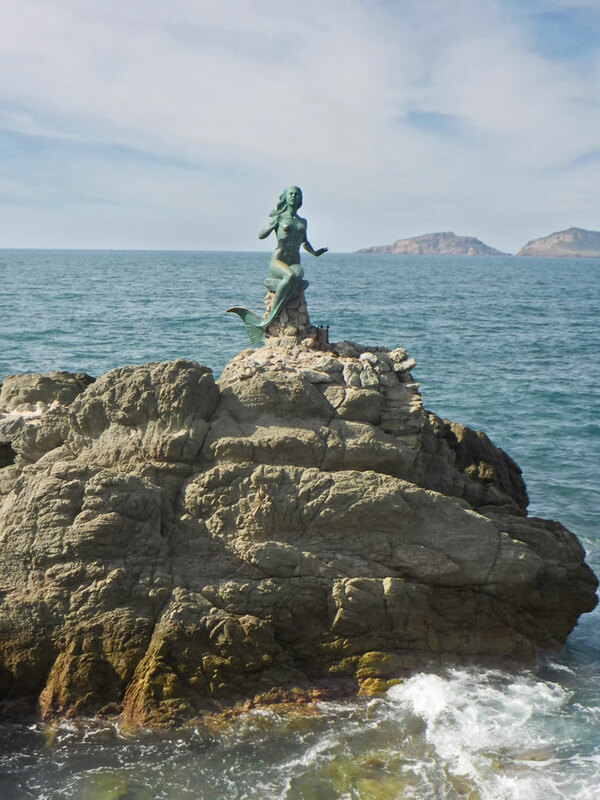 Many of the campgrounds are established pay RV parks and campsites that can be found in camping guides to Mexico, and have websites or roadside advertisements. But then there are the free sites which seem to be established by either one of two ways – asking a local where there are safe places to camp or just parking and seeing if anyone tries to break in or tells you to leave. Sometimes the information about the safety or availability of such sites can be old and change, or may be established by pure luck rather than the real legality or safety of such site. 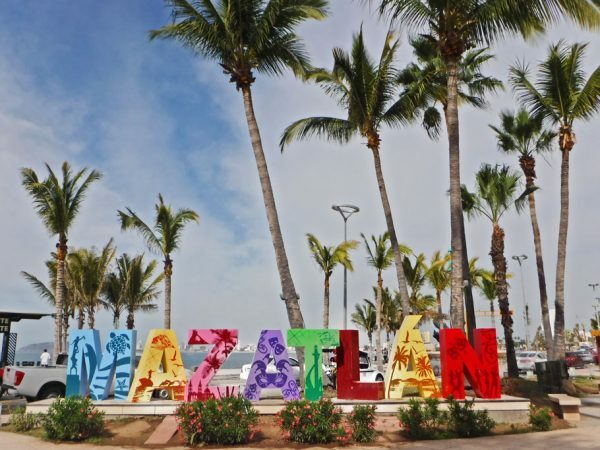 We had two of these free beach campsites to check out from iOverlander a little north of the main city center as we headed into Mazatlán. Driving to the sites we turned down a nice paved road that quickly turned into a dirt road lined with large houses, condos, and several homes under construction. We passed by our first spot – which was supposed to be a parking lot, but looked more like a place to pull off the road bordered by looming three story houses with gated driveways. Further down the road we found our second option. A short single lane dirt path led from the main road to a small clearing on a hill that could accommodate one or two cars. The site – strewn with trash and with a beautiful view of the beach – was basically as described in iOverlander, except for one thing. It was in plain view of several large fancy houses. We spent our first night there with no problems. We met one of the owners of one of the nice homes along the beach who walked up the hill to talk to us about the van. They were Canadian, escaping the chill of British Columbia. They had a Roadtrek van and were curious about our life and didn’t care at all that we were camping there. There were plenty of options on iOverlander for us to move to after the police ousted us, but the only other beach sites were south of the city, an hour drive away. Someone had marked a Walmart as a good overnight spot so we decided to check it out. The parking lot was really big, but exposed to the busy main road. We pulled up closer to the store away from view of passing cars and parked. We went in for a few groceries and saw a sign that said they would be closing at 11. I wasn’t up for asking in my limited Spanish if it would be ok to stay and didn’t feel comfortable with the idea of still being there as the store was closing down. I opened iOverlander again and looked for another spot. Not far away was a parking lot next to a police station. The reviewer said that they had asked for permission from the lot attended to stay and was told yes. 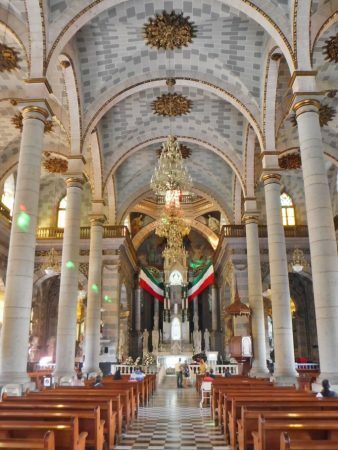 So we turned back out in the the dark and busy streets of Mazatlán to try again. We didn’t have much trouble finding the location but the parking lot – a dirt field – was so dark we did have trouble finding the entrance. There was no attendant on duty so we just picked a spot near the only other parked car and pulled in. We took off our shoes, pulled out the bed, and bedded down fully clothed (And me with my contacts still in) in case we got another knock on the door. All was fine until the band. Blasting out Mexican crooner standards they sounded like that were right across the street. No problem, we have slept through loud music before. It was the voices that really made us feel anxious. It sounded like someone talking on their phone right outside the van. We could have made out every detail of their most intimate conversation with their lover or the fine details of a late night business deal if only we knew enough Spanish. After what seemed like forever either the call ended or he walked away from the van and perhaps met someone on the street to chat with as we heard the murmuring of voices mixed with the sound of accordions and wailing love songs the whole entire night. I did not sleep. Greg, on the other hand snoozed soundly waking up only when the cacophony outside the door changed volume or pitch. * As always, click on pics to enlarge into a slideshow. The next day we hit the Malecón, a beautiful walkway/sea wall on the Pacific Ocean. This promenade is lined with scuptures and fountains. 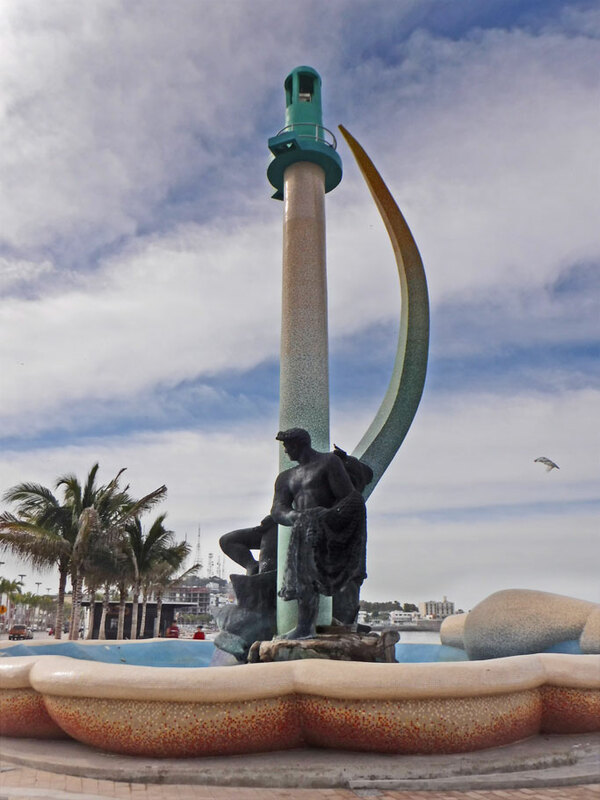 Here is “Alegoría Marina” (Marina Allegory) or better know to locals as “Los Monos Bichis” (The Bichis Monkeys – Bichis being derived from the adjective Yaqui bichicori, which means naked or with little clothing – which describes the man in the statue and his wife we can’t see on the other side.) by Rodolfo Becerra Gómez. Monumento a la Pulmonía. 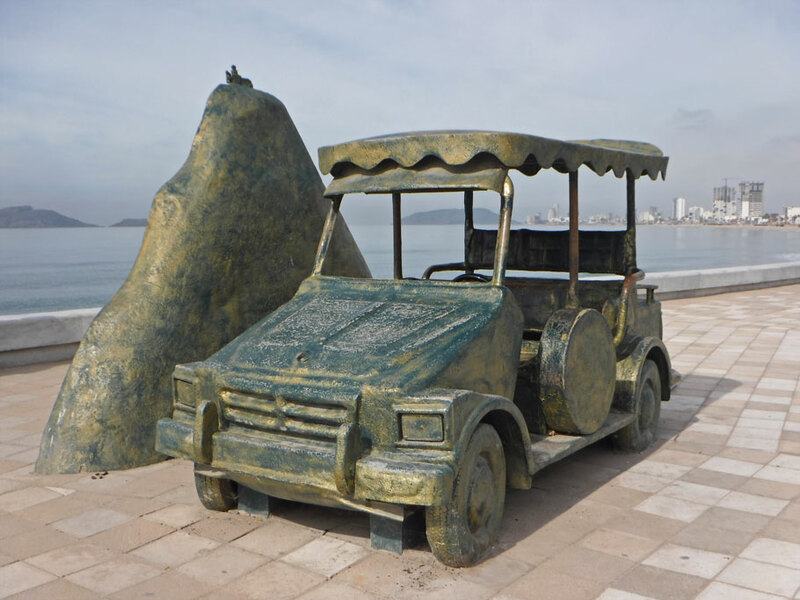 The pulmonías drive up and down the Malecón, honking and whistling for fares. 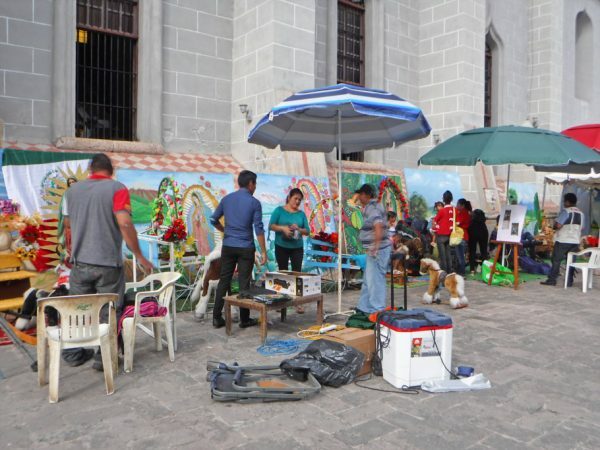 These iconic open air vehicles, the brainchild of entrepreneur Miguel Ramírez Urquijo, hit the Mazatlán streets in 1965 – an upgrade from wooden carriages pulled by mules called “Spiders.” The name Pulmonía (Pneumonia in English) came from the Pulmonías competion who spread the idea that riders would get pulmonía (pneumonia) if they road in them. 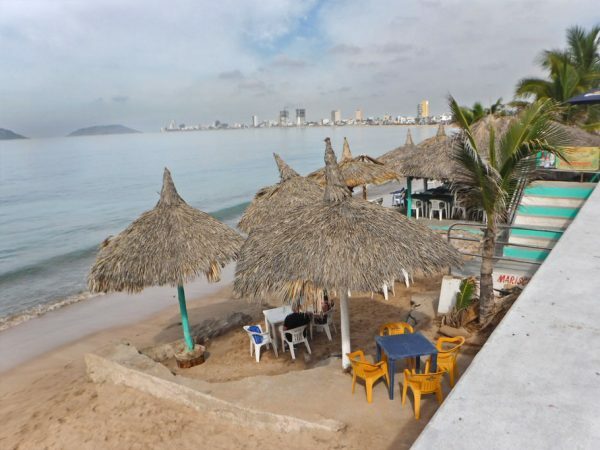 Below the Malecón walkway restaurants with beachfront dining under palapas line the beach. 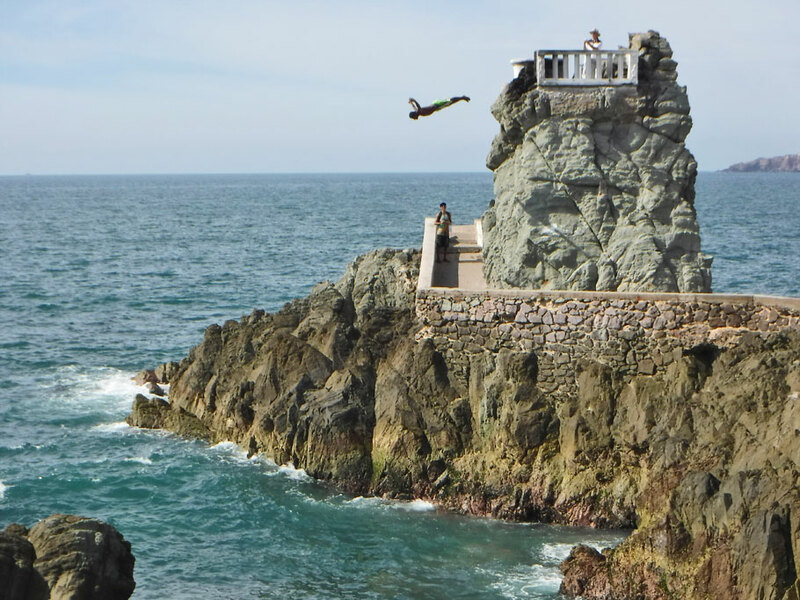 One of Mazatlán’s cliff divers leaps off the platform, barely clearing the rocky edge below, and plunging into water that can’t be very deep. Divers wait for tour buses to pull up. They take turns diving and asking tour groups for propinas (tips). Wish one of them would make a GoPro video. “La Sirenita y el Amor” (The Little Mermaid and Love) or “La Reina de los Mares” (Queen of the seas) a work by sculpture Jiménez Corona welcomes local fishermen and sea voyagers who stop at her port. Fishermen line one section of the beach here, cleaning and selling the morning’s catch. 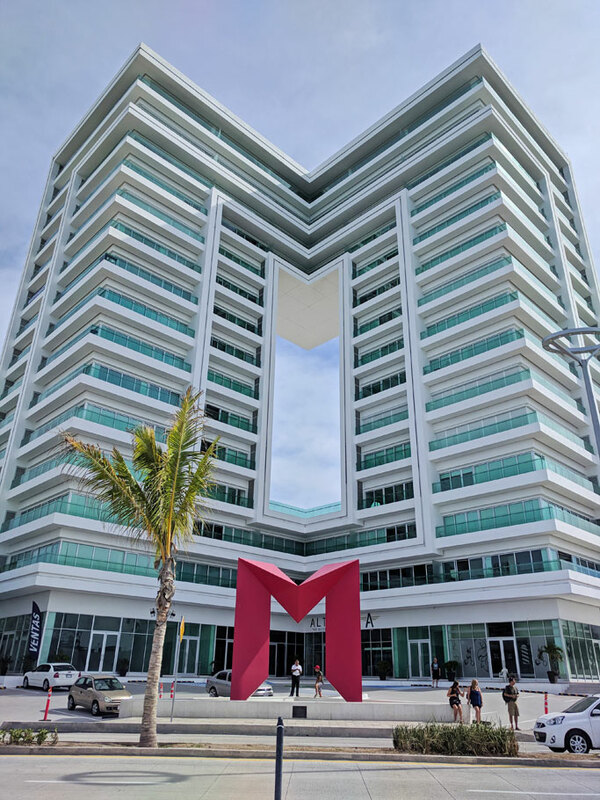 The modern Torre M building along the Malecón houses 110 condos and 3 penthouses with commerical business on the ground floor. It is not unusual to see people perfoming for tips at stoplights in the larger Mexican cities. 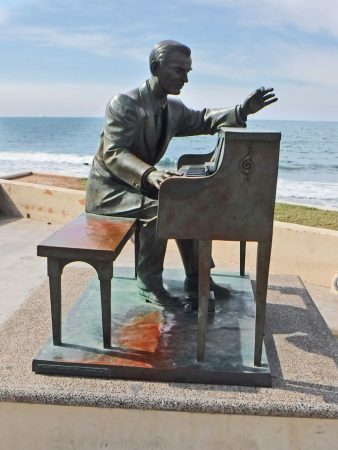 This is sculpture of Fernando Valadés Lejarza at the piano by Pedro Jiménez. Lajarza was one of the greatest artists of the Golden Age of Mexican music. 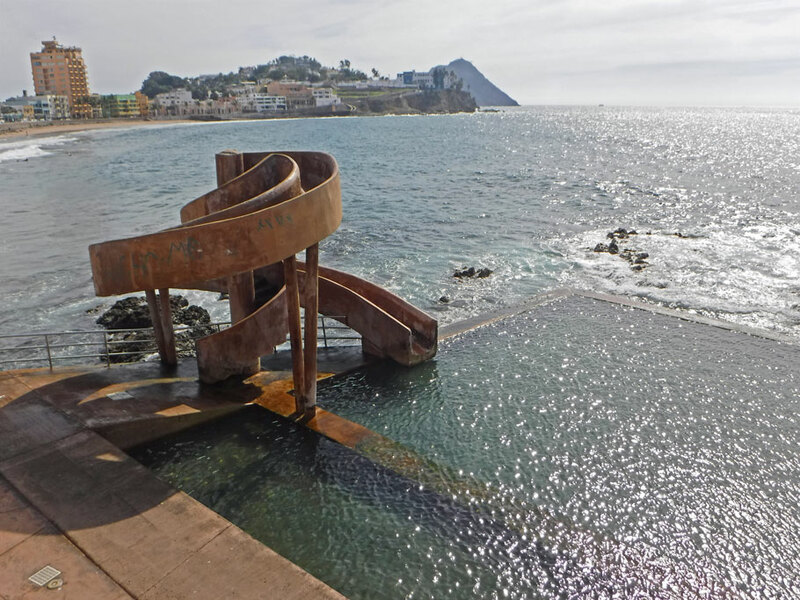 La Carpa Olivera – Alberca de Mar is a public saltwater swimming pool constructed in 1914 by businessman Antonio Olivera. 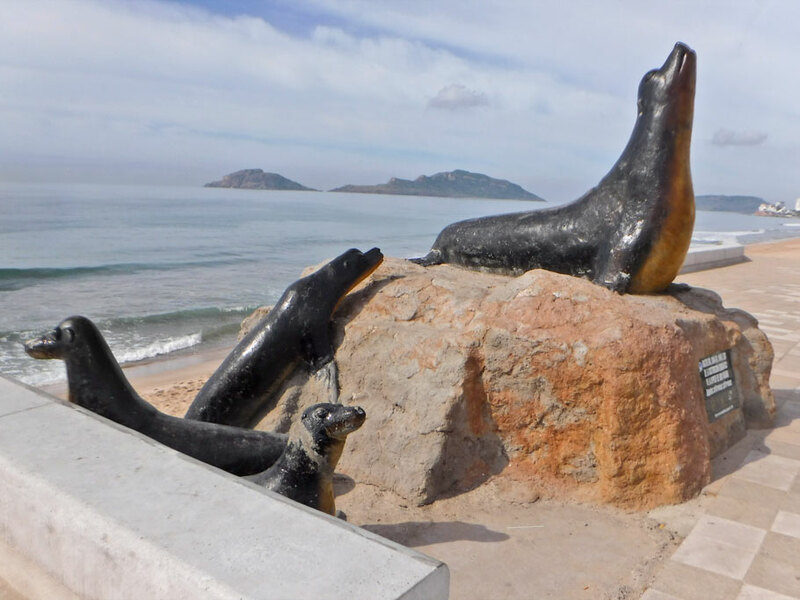 Los Lobos Marinos (The Sea Lions) by César Luna Orozco, is a monument to the California sea lions that call Mazatlán home from December to April each year and hang out on a small rocky outcrop off shore called Roca Tortuga. 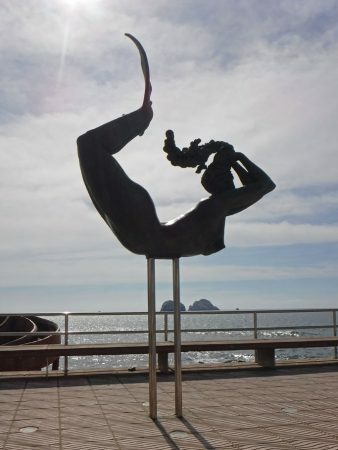 La Mujer Delfín (The Dolphin Woman) by Rodrigo Becerra Rodriguez. 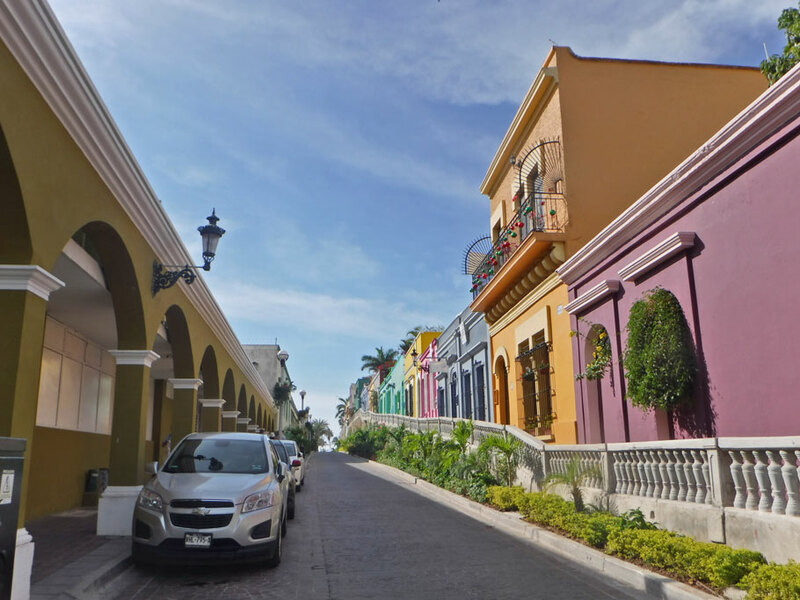 After our stroll down the Malecón we headed toward Plaza Republico in the historic part of town passing by colorful homes on cobblestone streets. 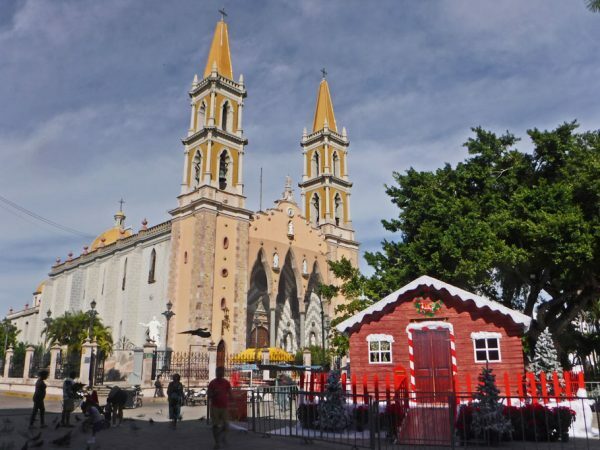 At the plaza we found the Basilica of the Inmaculada Concepción and Santa’s house. Shoe shines are popular in the square around the Basilica. 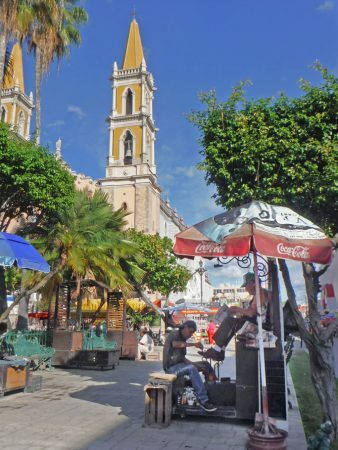 Actually shoeshines are popular in many of the small and large cities we have visited in Mexico. 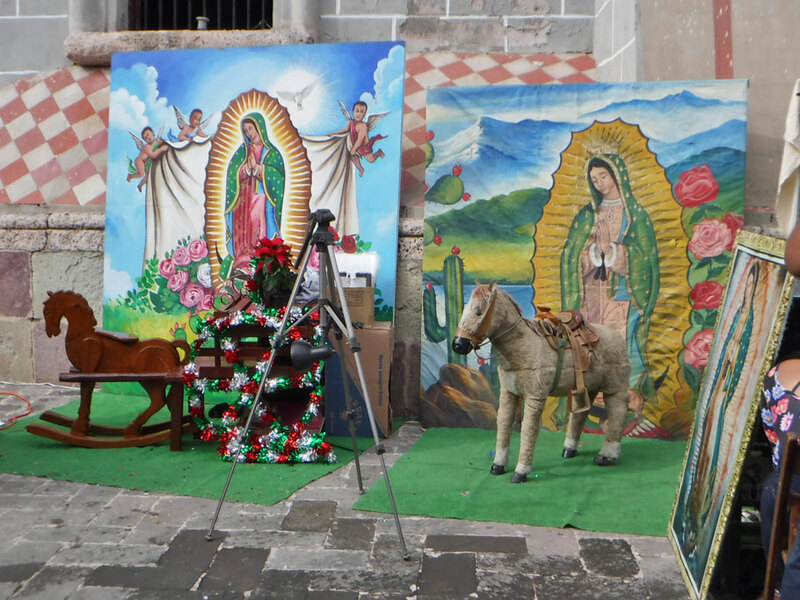 The day after our night in the dark and scary parking lot was Día de la Virgen de Guadalupe, a Mexican holiday celebrating the belief that a man encountered the Virgin Many in Mexico City in 1951. 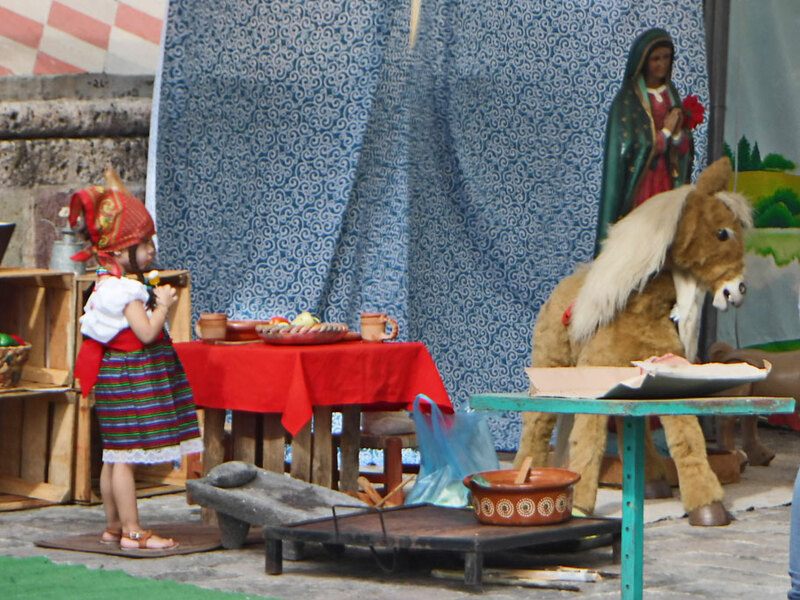 We walked back down to the Basilica that morning to see what kind of festivities might be going on. There was a mass in the Basilica so we joined and respectfully sat in the back. We didn’t understand much of it, except for the part where everyone stood and hugged or shook hands with their neighbor. This is a picture of the inside of the Cathedral from the previous day. 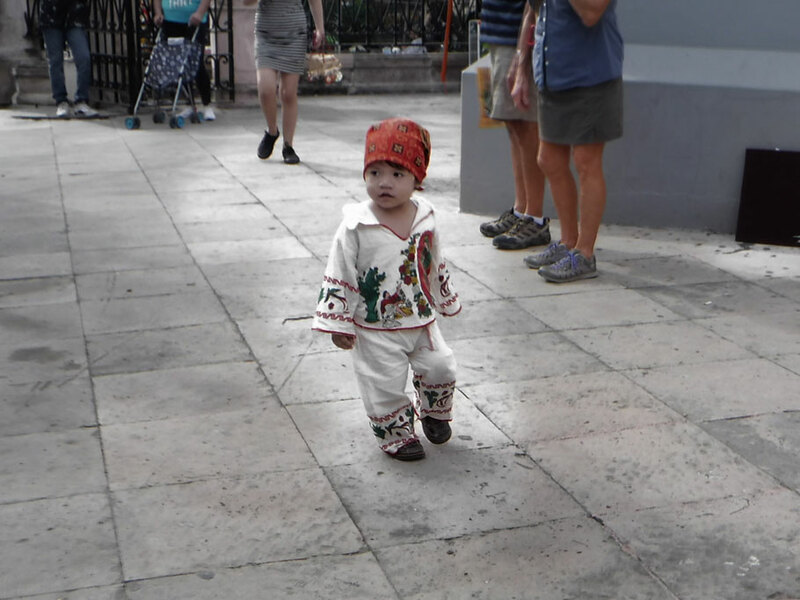 Many families we at the mass with their smallest children dressed up in traditional costumes. Outside the Basilica backdrops covered the Cathedral walls. These sets all included a painting of the Virgin and usally some kind of horse or amimal that the children would pose on to have their picture taken. A child waits to get her picture taken. There may have been more celebrations for the holiday but it was very early and we were worn out from our night in the parking lot so we called it a day and headed south to our next spot on the beach. This entry was posted in Mexico, Sinaloa, Travel On The Dirt and tagged Basilica, Malecón, Mazatlán, Mexico, Sculpture, Sinaloa, Street Preformers, The Police. Bookmark the permalink. Your story gave me chills but what a beautiful town! Mexico is one beautiful town after another, but not always so modern. If I gave you chills, I did my job! It was an experience I hope we don’t repeat. What an ordeal! Almost like being on anchor watch, but instead of worrying about crashing on shore, you’re worried about someone breaking into your van or being told to get up in the middle of the night and get moving. I think I am going to add a new tag category to the blog called “Moving in the middle of the freaking night” or something like that. This is the first time we have had to do it in the van, but had to do it twice before on the boat (once because a 55 foot boat was banging into our hull). It was unnerving – hope it never happens again. This is great, and the town looks so beautiful! I’ve got to add it to my list of future “must visits”! Thanks! It is a lovely town. I didn’t think we would spend so much time there but a whole day evaporated without us realizing it. Mexico is kind of like that. You are so right: the last thing anyone wants to happen when comfy in bed is to be chased (or scared) off. I think it will happen to all of us at some point, and I’m glad we didn’t have to get up and move yet, since having Zesty. It would be worse to do so in Mexico, especially at night. We hate driving at night in Mexico and Central America. 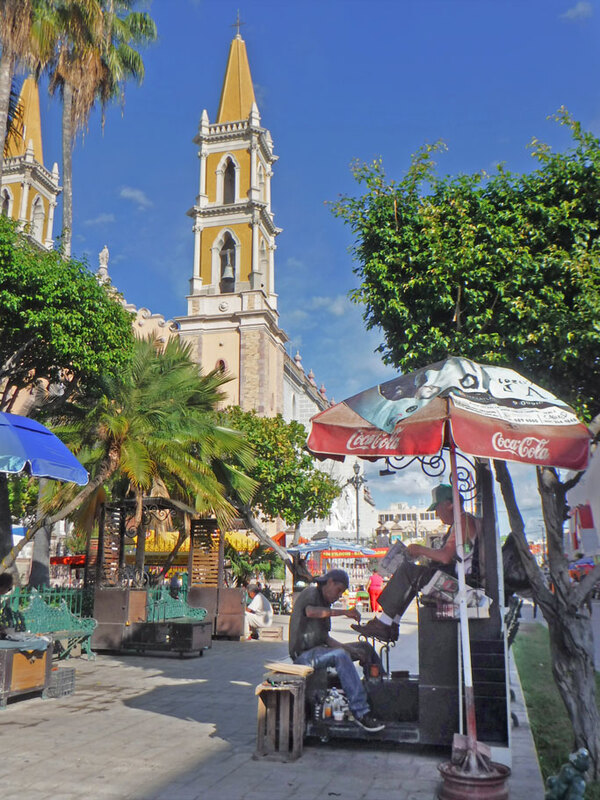 When we had a truck camper and traveled through Mexico in 2006, we did have your experience with the cop in La Paz, Baja California. That was before iOverlander, or even cell data connections. We left town at night and pulled over along the side of a busy road, where we saw other campers doing the same. We barely slept that night as well. I definitely feel less safe in situations I have less control over. Even on the few nights we had to move the boat in the middle of the night for fear of hitting or being hit by other boats or for fear we would drag, I knew we could remedy the situation by steering the boat out of harm’s way. I’m not sure what we’d do if someone actually broke into the van. I’m finding I like things clear and organized. I like to know where it is legal and expected to camp. There is so much of that in the US – not so much here. I’m not sure I could do this trip without iOverlander, Google Maps, or the internet. I don’t think I am as brave as you. But when I saw that young couple who had stayed on the Maelcon, I thought about how fearless and resilient the young are.